Thanks all for the advice. It's nice to have the pictures in one place. I hate to sound like a noob but my options are show crop, medium crop, and pet crop? correct? I'm going to have to say that, for Danes, "pet crop" is NOT an option. Kaos has a long show crop. They were standing by 7 months (but I am a tape Nazi). Kava has a medium shop crop, hers were standing in 6.5 months. They are a milk chocolate brown set we bought at Rooms to Go about 15 years ago. They were in our living room until we moved to Florida. They are starting to show wear, but mainly thanks to the cat. We have definitely got our money's worth. Holly has a medium show crop. I was able to stop taping about 6.5 months. Her ears were pretty easy, but i fought the tips for awhile. I did breathe right strips until she was 8-9 months, then gave it up. you can see in my pics that her tips are a little "flippy". But it gives her a little character. 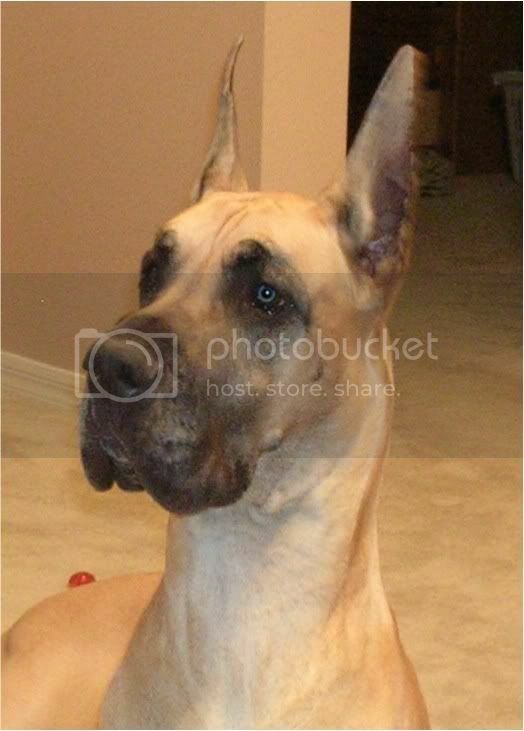 My next dane will have a long show crop, as i love the look of them! and now, much more experienced with danes. Maggie has a medium show crop. 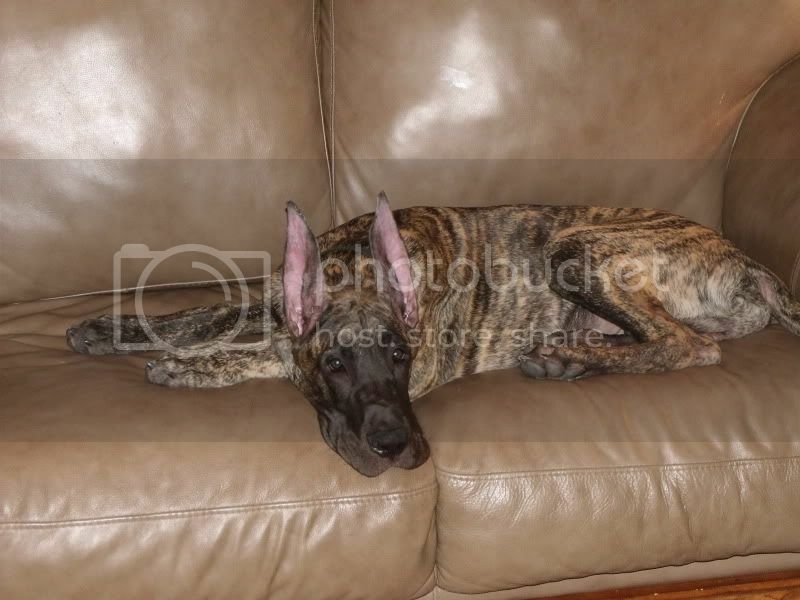 Our vet specializes in Dane crops and had a whole book of photos to choose from. She also said that depending on the dog's ear leather she may recommend a shorter crop so it will stand better. And interestingly she mentioned that she usually keeps more bell, on females because it looks more feminine. We agreed to that because some of the long narrow crops on particularly on black/mantles in the book looked a little more "scary". It was nice to work with a vet that could go over the specifics of size and shape. Clyde is now 10 weeks and has a medium-long crop. When I got to my vet's I got asked tons of questions as to what I wanted. Length is medium-long, I asked for a curved cut, the very tip of the ears are cut as well to prevent curling and also the chunk of cartilage at the base of the ear was removed as well (which is apparently the usual way to go with Great Danes). Emma and Glory both have long or "show" crops. When my vet (Anne Midgarden) does "pet" crops - they are just a tad short of a show crop and are still lovely...perhaps what some would call a "medium" show crop. They do tend to stand a bit more quickly. Mac (named after my favorite charachter in Its Always Sunny in Philly) has a long show crop. im not going to show him but i love the look of the long crop. Hello members, I am new here and I would appreciate some information as to cropped ear sizes in Inches. Gia is gorgeous and her ears are what I was hoping for and didn't get. I have a beauutiful show prospect puppy. I had asked the Vet for a show crop but not Extreme what I have on this puppy measures a scant 3 inches from skull to tip. She was cropped at 11 weeks and is now 4 months. They have not grown any taller. My question is : will they grow any as she gets bigger ? She is already a good size girl. Last edited by josephine; 11-03-2018, 10:50 AM.